Ah Sophia Loren. Watching Nine on the weekend I realised how beautiful she still is - stunning. This quote of hers I love even more. I'm having a moment lately, well it's more than a moment. It's a year. Since I got back from Europe last October (yeah I know right, it's September!) I can't fit into my favourite jeans. It's no biggie, it happens. I blame this blog (among other things). I'm trying new foods all the time, cooking desserts (which I never really did that often), and it's showing. But hey, I'm Italian! I love pasta. 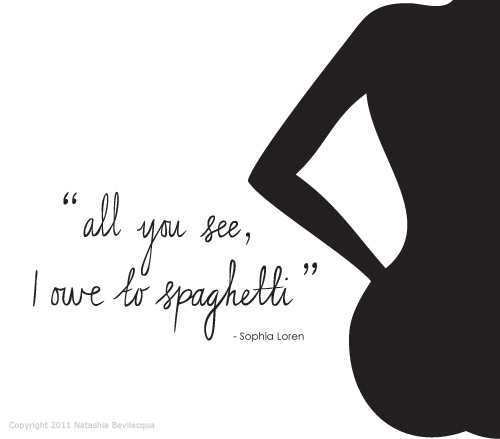 As Loren says, all you see, I owe to spaghetti (and pudding, and muffins, scones, cupcakes, the list goes on). And what am I going to do about it... well, I'm not sure yet. We'll see. Love a good salad now and then... This is one good variation from Ceasar or Italian Salad... YUM!